Dollamur Yoga Flooring comes in five and six foot widths and your choice of 1/2”, 3/4” and 1" thickness. Our premium vinyl is permanently adhered to cross-linked polyethylene foam to provide the comfort your clients desire and the durability you expect. 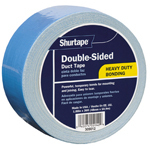 Delivered in large rolls, setup is a breeze and can easily be trimmed for wall-to-wall installation. With eight solid and two wood grain color options, you can transform your studio to a high end, custom look. Do you suffer from joint pain? You’re not alone! The Agency for Healthcare Research and Quality released a 2012 study that showed 40% of healthy weight adults reported suffering from joint pain. That number jumped to 58% for adults who are obese (defined as roughly 30 or more pounds over a healthy weight). The injury starts out very small, so your client does not really notice the pain, but over time the damage caused by the repeated stress can be severe. 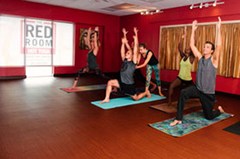 It is for that reason your yoga flooring needs to provide support for your clients. ... but don’t just take our word for it! Dollamur Yoga and Fitness Flooring is available in eight Tatami colors and two wood grains patterns. Looking for a custom color for your space? Contact us to discuss your studio’s needs! Worried about relocating? Not a problem! 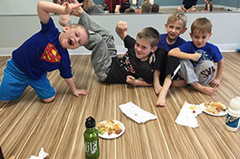 Dollamur yoga flooring can be rolled up and moved to your new facility. Investing in Dollamur matting now will serve your studio clients for many years to come! Colors Available: 8 Tatami Texture Colors and 2 Wood Grains: Rosewood,and Sandalwood. > 1/2" and 3/4" Rolls are $3.20 per square foot + Freight. > 1" Rolls are $4.00 per square floor + Freight. The Wood Grain colors are only available in 5' wide rolls. The eight Tatami Colors are available in 6' wide rolls. These normally take about 3 to 4 weeks to ship. They ship via Motor Freight. We would be happy to quote your facility (or home). Just click on the image below and provide information regarding what you would like. We will email you a delivered price. Yoga Flooring normally requires Double-sided Tape to keep the flooring in place and laying flat. It is engineered with a versatile adhesive system that provides strength and clean removability from the sub-flooring. We can provide this or you can pick it up at your local hardware store.